Since 2009, Québec’s Commissaire de la santé et du bien-être (Health and Welfare Commissioner) has published a report on the health and social services system performance, based on survey data, analysis and consultations. The 2014 edition offers 15 regional appraisals along with a report on the province’s global performance. A set of 258 performance indicators forms the basis of the analysis; some of these enable comparison with indicators used in Canadian provinces, and in the Commonwealth Fund surveys. The evaluation focuses on the health and social services system’s ability to meet its goals, namely to reduce the incidence, duration and negative effects of illness and social problems. The analysis focuses on the availability of resources (financial, human, material); innovation and transformation (physician use of technology); resource utilization and adaptation to population needs (adequate services, such as hospitalizations due to conditions that can be treated in the community, ease of entry into the system); community mobilization (e.g. donations and volunteerism); and system sustainability (balance between spending on administration and direct care). On the whole, Québec score fairly well in the Canadian context, despite having the lowest health spending per capita among Canadian provinces. In terms of human and material capacity, considerable resources are available to the population, especially with regard to medical specialists and advanced diagnostic technology. The Quebec system performs extremely well in balancing technical quality and productivity, as well as technical quality and accessibility. System performance suffers from a lack of continuity and coordination between different providers and levels of care. Quebec achieves worrisome or very worrisome results in this area, both when compared to Ontario and Alberta, and against countries participating in the Commonwealth Fund surveys. 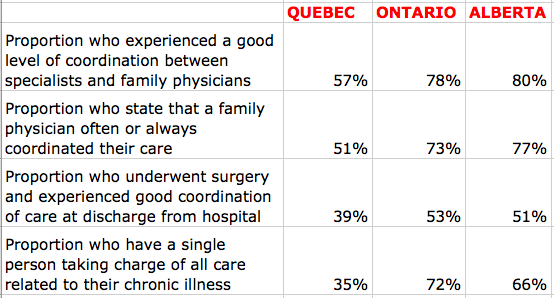 Only 62.4% of Quebeckers had a family physician in 2013. And people with the greatest health needs very rarely have a single person in charge of coordinating their care. Access to routine care, follow up and post-discharge care following surgery are problematic. The most recent Commonwealth Fund survey finds that the proportion of people who found it difficult to obtain medical care in the evening, on weekends and holidays was 27% in the UK, 57% in Ontario and 61% in Quebec. The Commissioner’s report analyzed innovation and transformation as it relates to continuity, and Quebec’s performance was found to be nearing the critical zone. The Commissioner states: “Given the resources available, performance in innovation and transformation, as well as in continuity and coordination, should be much better.” Quebec receives a grade of 71.9% on achieving targets in continuity and coordination and places 3rd among the 3 provinces that track these indicators; Alberta (at 97,6% target achievement) and Ontario (at 96.1%) have much better results. 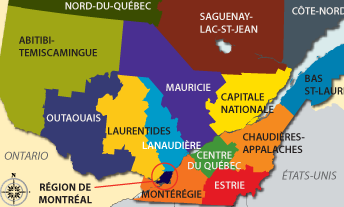 The Commissioner’s report goes on to compare different regions within Quebec. Performance of the health and social services system in Montreal shows relative weaknesses in the areas of efficiency, adaptation to population needs and on global levels of care and services. Montreal appears to suffer more than other regions in the province in terms of ease of entry into the health system. If we compare the two largest cities, both university centres, in Montreal 64.9% of the population states having a regular physician (family physician or specialist), compared to 81.8% in Québec; 13.8% of the population in Montreal states not having a regular physician because they were unable to find one, compared to just 5.2% of Quebec City residents. Montrealers also have very low use of CLSC services (265 per 1000 inhabitants, compared to a maximum of 511 in Abitibi and 360 in the Eastern Townships). The regional analysis of physician use of information technology also shows significant variation. 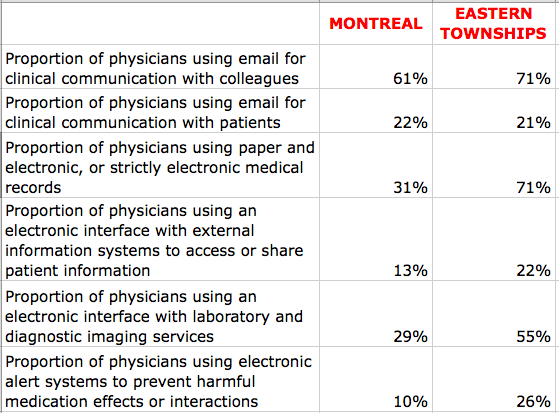 The Eastern Townships have obviously put much more effort into this area than any other region and provide proof that a culture of electronic health can thrive among Quebec physicians: the region’s results are higher than even the best-performing provinces in Canada. Unfortunately, the shift is not yet in evidence in Montreal, at least according to the 2010 data used in the Commissioner’s report. The Commissioner’s report interestingly includes analysis of what it calls community mobilization. This measure is based on two indicators. On the first, the proportion of donations in health centre budgets in a region, Montreal is way ahead of all other regions, with 1.81% of budgets coming from donations (compared to 0.27% in Quebec and 1.01% in the Eastern Townships). However, on the second indicator, per capita spending on community organizations, Montreal is well below the provincial average, at $59.10. The Commissioner does not analyze this finding. Not does the report provide an analysis of regional differences. In this reviewer’s mind, however, the result points to a significant cultural difference between Quebec’s metropolis and other regions, which affects population access to, and use of, health services. The prominence of major university health centres attracts both community support and community reliance, serving as beacons towards which people naturally gravitate when they need care. The ability of the CSSS (health and social services centres) to sufficiently assure access to primary care in Montreal is compromised for a great variety of reasons, with the net effect that many people are left floating between discreet and punctual providers of care, who have little incentive and less ability to connect (electronically or otherwise) with other levels of care. It seems evident that a different set of strategies will be required to improve access, continuity and coordination in the Montreal context and that this will likely involve a greater outreach function for the major health institutions Montrealers actually recognize, along with much greater effort on the part of the CSSS to build real communities, of both users and care providers at all levels.